Rapid Release Therapy is a breakthrough in therapeutic technology. Many types of chronic pain have been identified, however many with chronic pain do not have a clinical diagnosis from their doctor. Scar tissue is frequently the culprit in this un-diagnosed pain. Repetitive motion, injury and surgery can result in the formation of scar tissue. Since there are no blood vessels that nourish this fibrotic tissue, it dies, becoming rigid and inflexible, impinging nerves and impairing normal movement. RRT's scar tissue thereapy targets brittle scar tissue with the shearing force of planar waves to resonate with scar tissue. The K-LASER has been found to offer superior healing and pain relieving effects when compared to other electrotherapeutic modalities. The K-LASER can also be used for acupuncture point stimulation. Low level laser therapy is a universal method of treating muscle, tendon, ligament, connective tissue, bone, neurological dysfunction or damage, and skin tissue with one simple piece of equipment. When combined with chiropractic care the best results are achieved to organize the nervous system and promote healing. Low level laser therapy is a major advantage for athletes due to the neurological applications and the extremely fast results that can be achieved. Infrared Saunas are an effective tool for natural healing and prevention. Infrared has the ability to penetrate human tissue which in turn produces a host of anti-aging health benefits. If you want to get yourself back into balance, infrared sauna maybe the ticket to achieving your wellness goals. Technology : How Does It Work? Acceleration Training™ with Power Plate® machines creates instability in the human body, as with each vibration the body is forced to perform reflexive muscle actions, multiple times per second. Furthermore, these contractions must work in multiple dimensions as the Power Plate® machines actually oscillate in all three planes, exactly as the human body is designed to do. The net result is an incredible improvement in force production, or strength and power. ​PEMFs address impaired chemistry and thus the function of cells - which in turn, improves health. PEMFs deliver beneficial, health-enhancing EMFs and frequencies to the cells. Low frequency PEMFs of even the weakest strengths pass right through the body, penetrating every cell, tissue, organ and even bone without being absorbed or altered! As they pass through, they stimulate most of the electrical and chemical processes in the tissues. Therapeutic PEMFs are specifically designed to positively support cellular energy, resulting in better cellular health and function. Basic beneficial actions PEMFs will have in my body? 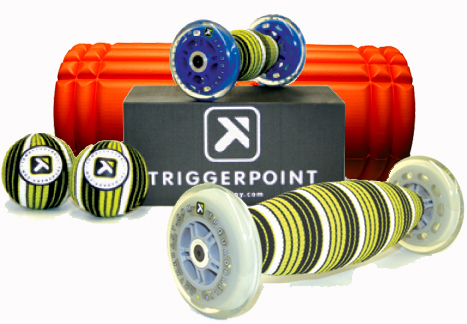 Trigger Point Performance Tools are recovery tools that assist in unlocking tight muscles, reducing soreness and enhancing athletic and every day performance. Each tool is designed to release tension through pressure and release techniques on specific trigger points in the body. PEMFs address impaired chemistry and thus the function of cells - which in turn, improves health. PEMFs deliver beneficial, health-enhancing EMFs and frequencies to the cells. Low frequency PEMFs of even the weakest strengths pass right through the body, penetrating every cell, tissue, organ and even bone without being absorbed or altered! As they pass through, they stimulate most of the electrical and chemical processes in the tissues. Therapeutic PEMFs are specifically designed to positively support cellular energy, resulting in better cellular health and function. One of the most basic functions magnetic fields have in the body is to increase circulation. When a cell (such as a red blood cell) is injured or ill, it does not hold its ideal charge. This causes red cells to "stick" together, making circulation slow. When a magnetic field passes through the red cell, the membrane becomes properly charged, allowing the cell to repel itself and keep itself separate from other red cells, thereby increasing circulation. In addition, PEMFs increase various chemicals in the blood vessel walls that cause the blood vessels to dilate, improving the amount of blood flowing through the vessels and therefore increasing the amount of oxygen delivered to the tissues. Poor circulation makes tissues unhealthy and prone to disease and breakdown. Improved circulation helps tissues get the nutrition and oxygen they need, while expelling the waste they produce. Good circulation helps with tissue healing and regeneration. The result of improved circulation is the reduction of swelling and the removal of bruising. Muscle energies also improve through a process called Myosin Phosphorylation. Myosin is muscle, and phosphorylation is energy (ATP) production. This allows muscles to work harder and longer, and recover more quickly from their work. Muscles that are contracted or in spasm are better able to relax, decreasing tension and reducing the pain caused by spasm. Inflammation is a cascade of physiologic processes initiated by the body to repair cellular damage in tissues by increasing the blood flow to the damaged area and increasing the number of good inflammatory cells. The process of inflammation is generated and supported by the interaction of a number of immune cell types, with other cell types (like T cells) playing a regulatory role in the cascade effect. Inflammation is a necessary and beneficial process, but it often persists longer than necessary, sometimes developing into chronic inflammation. PEMFs have been found to reduce chronic, damaging inflammation. Inflammation can be initiated by many causes, and knowing the nature of the cause is important in designing therapeutic approaches. T cells are a major regulator of the inflammatory cascade. In bacterial infections, early infiltration of the affected tissues by white blood cells is followed by the arrival of T cells, which kill bacteria. In this circumstance, eliminating of T cells can delay or stop healing. Conversely, in trauma-induced injury, T cells are less important to the healing process, and may be harmful if present for too long. In this case, elimination of T cells can minimize the unwanted effects of inflammation, accelerate healing, and reduce the risk of chronic inflammatory diseases. In chronic inflammatory diseases such as rheumatoid arthritis, psoriasis, or tendinitis, T cells support the persistence of the disease state, and removing them would be favorable. Research shows us that PEMFs can induce the appropriate death of T lymphocytes, by actions on T cell membranes and key enzymes in cells. For example, PEMFs affect ion flow through specific cell membrane channels (like those for sodium, potassium, and calcium), which positively affect these enzymes. Stress is part of being human. Too much stress is very harmful to the body, and accelerates aging. Stress is responsible for at least 65% of our illnesses, so stress reduction is necessary for all of us. Stress-reducing activities performed only now and then will allow too much stress-related damage to accumulate over time. Therefore, stress reduction must be a daily activity. Magnetic fields have many stress-reducing effects. Daily use of PEMFs help to wash away the negative effect natural stresses have on our bodies. Magnetic fields pass through the body - even the bones - as if the body wasn't even there. PEMFs work to repair bones, whether they are damaged by surgery, injury, or disease, and have been found to improve bone regeneration such as occurs with osteoporosis and osteopenia, among other bone destroying conditions. Just as a fire cannot burn without oxygen, our cells cannot produce heat and energy without oxygen. Our lungs extract oxygen from the air we breathe. It passes into our blood and is carried by arteries away from the heart and delivered to the rest of the body, including all the organs. PEMFs help with the process of extracting oxygen out of the air we breathe and help it to be transported into the circulation. The absorbed oxygen is then transported through the body to all the cells, where it is absorbed into the individual cells. In the cells, enzymes and other basic cell energy production processes use the oxygen for cell metabolism, the energy necessary to function properly. The metabolism of an organism determines which substances it will find nutritious and which it will find harmful. Proper blood-oxygen levels at the cell level (not just in the blood vessels) allow this process to continue quickly and efficiently. After the oxygen exchange takes place, veins carry deoxygenated blood and metabolic waste products away from those same cells and back to the heart for recycling again. In addition to these basic balancing actions, magnetic fields may also help with many other functions and conditions, and new ones are discovered regularly. RecoveryPump delivers an aggressive but very natural alternative to passive recovery for athletes. Our system simulates localized "active recovery" (such as walking) in a passive manner because the therapy is conducted at rest. Use of RecoveryPump's sequential compression therapy 1-2 hours per day will produce results similar to the benefits of 12-48 hours of rest. This therapy increases venous return, rapidly accelerating the body´s re-absorption of the elements causing soreness and fatigue in the muscle. It effectively removes metabolic waste faster than any traditional mode of recovery or rest alone. The technology utilized by RecoveryPump is based on some of the latest clinical studies on muscle physiology and sports injury recovery. Active Compression Therapy does more than just relieve the symptoms of stress to the muscular system; it tackles the causes of muscle soreness, and its accompanying impact on performance, right at the source. The muscle pain, tenderness and fatigue that you feel after high levels of exercise is primarily due to muscle cell micro damage and inflammation, which leads to the accumulation of lactic acid, creatinine and other metabolic waste the body cannot clear completely during exercise or normal cool down. Simply put, the increasing accumulation of waste and water in the muscle after exercise causes a decrease in performance and an increase of muscle fatigue. These elements must be removed via the venous and lymphatic system to efficiently recover the muscle. Our lymphatic system and blood vessels work together to flush waste from our cells naturally. Muscular movement, however, is needed to stimulate this process because the lymphatic system does not have a pump, like the heart does. Often athletes will perform light exercise to achieve this muscle contraction and increase circulation in the body, thereby reducing soreness in the muscles. ARC offers a variety of recovery tools that can help enhance and speed up your recovery. All of our tools are state of the art- many of which are used by professional athletes. At ARC you will be taught how to use all of our recovery tools on your first visit. Dr. Wardy has extensive knowledge in how to use all of our recovery tools and how they can aid your body in the recovery process.